Mayo County Council and Aras Inis Gluaire/Erris Arts Centre invite submissions for three public art projects/residencies in Erris, County Mayo. This is an exciting opportunity for artists to work with communities and revisit some of the Tír Sáile sculpture trail sites with new artistic vision and approaches to contemporary public art practice. The original trail was developed nearly 25 years ago and is currently undergoing a thorough maintenance programme including repairs, new signage and a new website, to be launched alongside the residency programme. In addition to the residency programme artist Dorothy Cross will be working on a research project during the Summer and it is hoped a significant new commission will be realised in the following year. Mayo County Council has an excellent reputation for commissioning high quality, contemporary artworks, working with artists in all art forms. Recent programmes include Landmark www.landmarkpublicart.com , Changing Tracks www.changingtracks.eu and FIND www.findartproject.com featuring a range of permanent, temporary, performance or event based and socially engaged practice. See www.publicart.ie Mayo archive for further information on a selection of artworks in County Mayo and also www.mayococo.ie under the public art section in the arts service area of the website for details of ongoing commissions and a projects archive. The idea for the original Sculpture Trail had its genesis in the discovery of the most extensive Neolithic site in the world at Céide Fields on the North Mayo Coast. The sculptures/artworks were put in place during 1993, the year of the Mayo 5000, which was a yearlong cultural celebration inspired by the surviving human imprint in earth and stone on the Mayo landscape over fifty centuries. The artworks were created during the course of a three week long sculptural symposium in June 1993. While some remain intact and in good condition, others have disappeared over time. A more recent addition to the landscape is a series of architectural interventions by American architect Travis Price which can be found at sites near to and in between the Tír Sáile sites. A series of arts venues now exist across the length of the trail, from Ballina Arts Centre, to Ballinglen Arts Foundation (Ballycastle), and Áras Inis Gluaire/Erris Arts Centre (Belmullet) which is about to celebrate its 10th anniversary. This programme of residencies seeks to revisit key areas that were included in the original trail and to explore new approaches to working with local communities and creating public artworks. The project seeks to look forward to new and developing trends in public art production and showcase a possible future for art trails and experiences within the dramatic North Mayo landscape. Mayo County Council invites artists to develop proposals for these commissions/residencies. Artists can apply for any or all sites but the intention is to have a different artist for each site. Artists are encouraged to respond to one of three areas, included in the Erris section of Tír Sáile, as outlined in the Locations details below. We aim to engage with innovative artists to realise contemporary artworks, assumed at this stage to be temporary, ephemeral, performance or similar, which will provide artists with opportunities to engage with the North Mayo landscape and local people. All artforms will be considered, there is a flexible approach to these residencies and groups of artists are also welcome to apply. Claggan Island (Oileán Chloigeann) was officially declared an island in 1991. It is situated on the north-eastern corner of Blacksod Bay, about 12kms from Belmullet and is one of the Mayo Discovery Points on the Wild Atlantic Way. The island is linked to the mainland by a narrow, sandy causeway that divides Trawmore Bay from Blacksod Bay and it is circled by beautiful sandy beaches. This was originally site L.
Possible community links /supports – a tiny community live on the Island, including the Howard family, who run an innovative new holiday accommodation on the island See http://belmulletcgs.com/rooms_type/accommodation/ The nearest school is approximately 2 miles away Glencastle school and the townland is Shragh. Accommodation – Whilst the Claggan pods could be available for a section of the residency, suitable nearby accommodation will be provided for the artist. There are a variety of groups, schools and businesses in the town. The Civic building which houses the Arts Centre is also home to the library, local council services, Mayo Ideas Lab and the court services. The arts centre has a gallery space, workshop space and theatre. Accommodation – Áras Inis Gluaire/ Erris Arts Centre has recently purchased a house to be used for visiting artists and residencies and the artist working in Belmullet will be able to stay at this house, next to the arts centre in the town. Artists are invited to respond to, or site work in any part of this area. Caochán, after whom the peninsula is named, was a legendary giant of Celtic sagas (poss 1st century AD) who had only one eye. His image was represented on the slopes of the hills overlooking Sruwaddacon Bay, originally site J on the trail. Please note as this is a Gaeltacht area, Irish speakers or proposals that seek to engage with the Irish language will be given preference for this particular residency at Carrowteige. (This advertisement is also available in Irish). There are a number of nearby self catering accommodations and a suitable place will be provided for the selected artist. A seminar including launch events for the residency outcomes will take place in September. This will be at the Áras Inis Gluaire/ Erris Arts Centre and will include presentations of the new artworks, possible tours of sites and guest speakers exploring the origins of the trail, and current contemporary public art practice. Dorothy Cross will also talk about her practice as part of this event. Maximum budget is €10,000 for each residency, and will cover design, supply, installation or performance, artist’s fee and any community involvement initiatives, inclusive of all costs, VAT, insurance and other charges. This is based on approximately a one month residency period, 2 week research and development phase and attendance at launch events. It is assumed approximately €7,500 be allocated to the artists fee and €2,500 for materials or other residency or performance/outcome costs. Artists are welcome to suggest how they would like to breakdown the budget to suit their proposal. Accommodation for the full period of the residency will be provided and further supports around documentation, launch costs, marketing etc will be provided. This is initially a one-stage competition, open to all artists. If a clear choice can not be made from the stage one submissions and further, detailed information is required a limited number of artists may be invited to develop proposals further and an honorarium will be paid to each shortlisted artist. Selection Panel: Relevant Arts expertise, Erris Arts Centre, Mayo County Council and community representation. 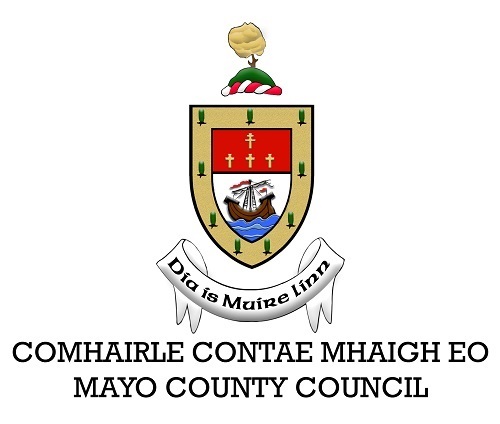 Mayo County Council retains the right not to commission if a selection is not recommended by the selection panel. Gaynor Seville, Public Art Coordinator and Brendan Murray, Director of the Arts Centre will be available to run through the brief and answer any questions. Email submissions: Ensure all files combined in the submission are less than 10MB in a zipped file. Dropbox must be used for larger submissions. If any additional large materials are provided it is the artist’s responsibility to collect these after the panel has made their decision. This entry was posted on February 23, 2017 by waterfordarts in General and tagged Aras Inis Gluaire/Erris Arts Centre, Artist, arts, Arts Venues Mayo, Belmullet, Carrowteige, Ceide Fields, Claggan Island, Co. Mayo, Dorothy Cross, Mayo Co Co, Public Art Commission, Public Art Residency, Sculpture Trail, Tir Saile.